On the hunt for Leonardo da Vinci ever since starting on the novelization of my time travel novel, but it seems, instead, he’s been stalking me. The genius is very much alive. A few of the most notable Leo sightings, up-close-and-personal. 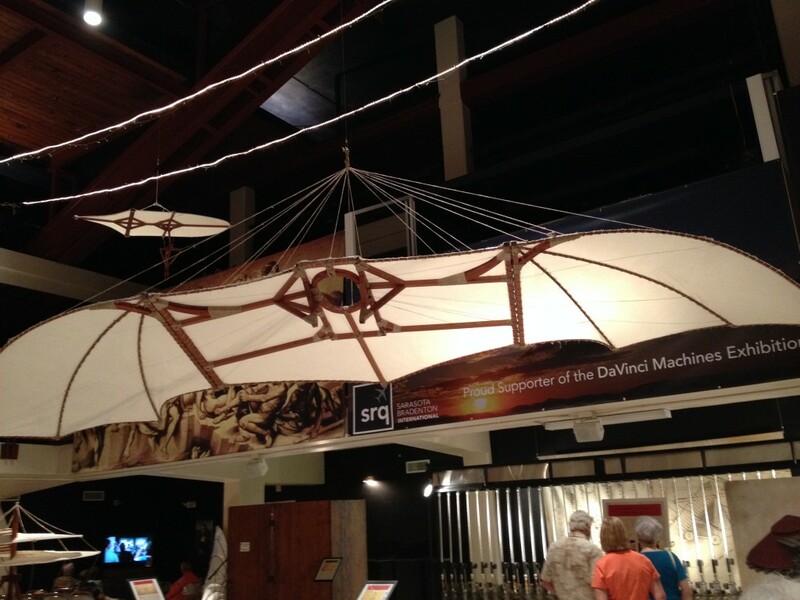 The Da Vinci Machines exhibit, currently on display in Bradenton, Florida. 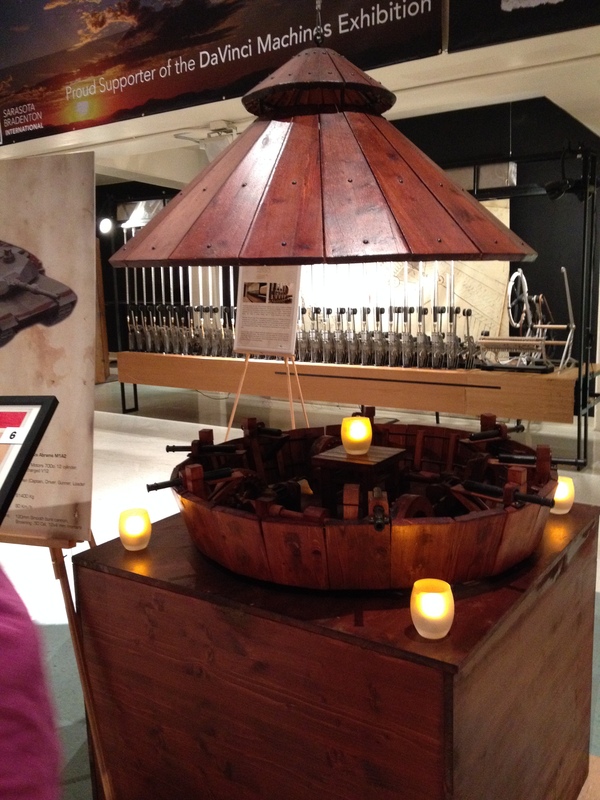 Artisans from Florence, Italy, have constructed life-sized models of a series of Leonardo’s inventions found in his writings and jottings and sketches found in more than 13,000-known pages of Leonardo’s codices (definition: notebooks; singular, codex. From the Latin. Think Renaissance blog). There are an additional 20,000 or so pages from codices that scholars suspect lay hidden and molding in unsuspecting people’s attics and musty shoe boxes throughout Europe. Here is material evidence of Leonardo’s genius in plain sight for the throngs of kids, teachers and adults visiting the exhibition. A creative thinker who could design a modern tank from observing turtles, whose glider emerged from hundreds of hours watching and sketching hawks in flight, the first working robot, and myriad seemingly modern inventions–all from the mind of a 15th-century man. 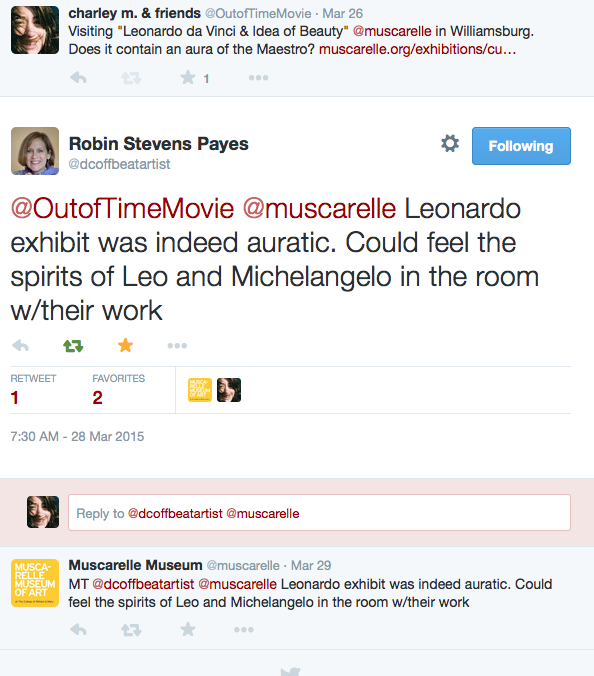 Of course, there is another, perhaps more famous side to Leonardo: his art. 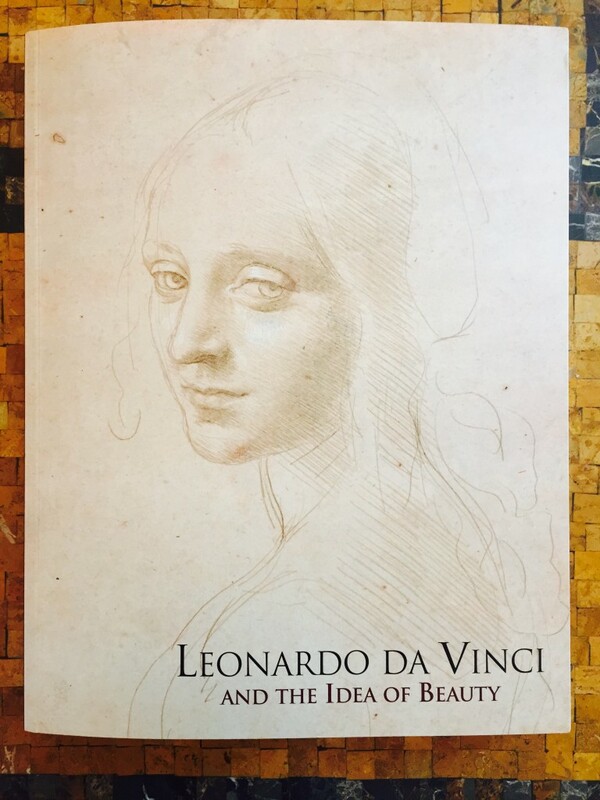 Which took me to Williamsburg, Virginia, recently, to see an exhibition, “Leonardo da Vinci and the Idea of Beauty,” at the Muscarelle Museum of Art on the campus of William and Mary. While, still today, the Mona Lisa and The Last Supper get most of the press, observing the master’s drawing skills at close hand is a thrill. 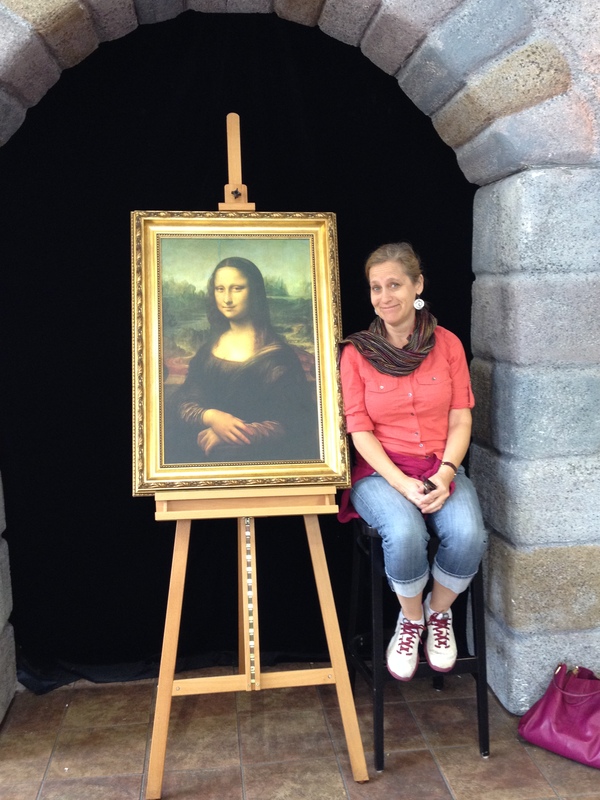 I felt the hand of the artist on my shoulder as I stepped up to each new piece on display. On display: attributes of left-handedness — shadowing and drawing lines diagonally from up left to down right to avoid smudging and see the trajectory of each line — that make him unique among Renaissance masters. To breathe in the antiquity emanating from these 500-year-old papers and parchments. To feel the aura of the artist in the room, looking out from the shadows and into my eyes even as my eyes took him in. How fitting to see this inveterate doodler through the eyes of twenty-first century technology. And how like Charley, the protagonist of Out of Time, to want to record what she sees, things to remember and the many other pronouncements of her own curious, creative and inventive mind in a blog and on social media. 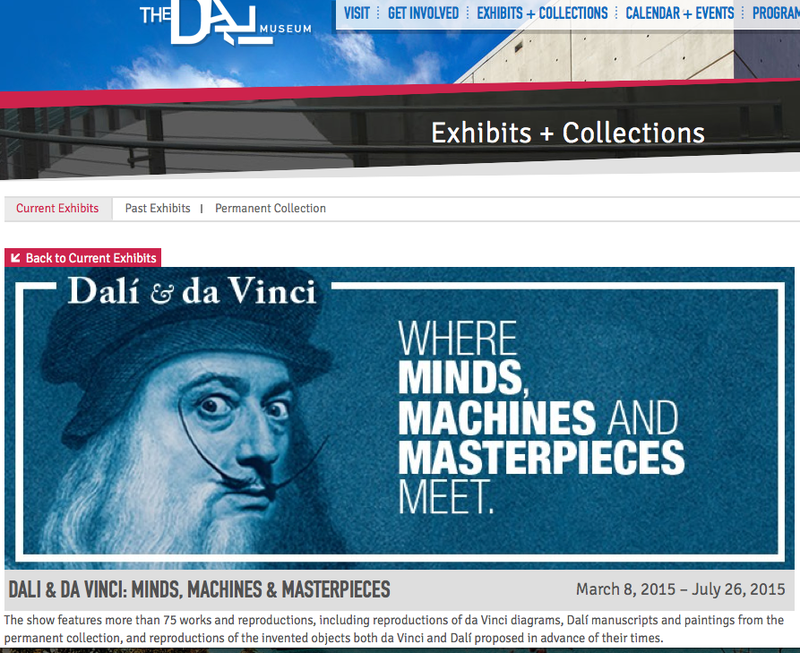 Where Minds, Machines and Masterpieces Meet. Seeing yet another side of Leonardo’s genius up-close-and-personal? Can’t wait!